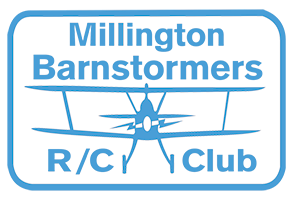 The club was started in 1989 with the help of some people working in Millington and modelers of other clubs. With an agreement by Browning Farris these guys were allowed to use the old landfill site on Sykes Rd. Rocky Krantz, Victor Laurent, Roy Wright and the Brown brothers, just to name a few, started flying off of the road that ran from south to north on the west end of the airfield. They did not have any awnings or tables as we do today. By the second season the club membership had grown to approximately 12 members. Several of these members worked in construction and along with Browning Farris donated materials to build the awning and to pour the concrete floor. In fact some the names are written in the concrete at the west end of the pavilion. The membership continued to grow and help the club progress. When members from another club joined, including a man by the name of Jim Prilliman, the club really started to evolve with the establishment of Pylon racing and Fun-Fly contest. The Millington Barnstormers named their airfield in memorial of Mr. Jim Prilliman (Prilliman Field) in 2010. However, more recently, the club experienced the loss of a much loved member. Bobby Peirce was a shining example of grace and a servants heart. He was not the greatest pilot or builder, but he LOVED the hobby and he LOVED this club. It was not an uncommon sight to see him mowing the runway or doing some other maintenance that needed to be done without asking for any kind of compensation. He was never a stranger and always had a word of encouragement for anyone who needed it. For this, the club renamed the field in his honor. As you may see, this club is really a result of a bunch of great people, modelers, and individuals who wanted a nice environment to promote friendship, interests, and participation in the R/C hobby.